MSI has a long history of building high performance and high reliability components whether it be graphics cards or motherboards. Along with inclusion of the Military Class components and newer technologies such as the GPU Reactor feature, they are really moving forward in ensuring service to both the high performance gaming market and the enthusiasts overclocking segment as well. MSI has a long history of departing from the reference design, be it a different cooler or a custom PCB. This has effectively ensured that all different types of users can find what they’re looking for. Today we are looking at one of the full custom models in the MSI R7870 HAWK edition graphics card. The R7870 HAWK is based on the 7870 GPU from AMD, which is in itself a powerful chip. We’re very interested to see what MSI has brought to the market with this card, and how much of it is substance as opposed to flair. The HAWK R7870 is an HD 7870 GPU paired to a full 2GB of VRAM through a 256-bit memory bus to handle resolution/texture duties. 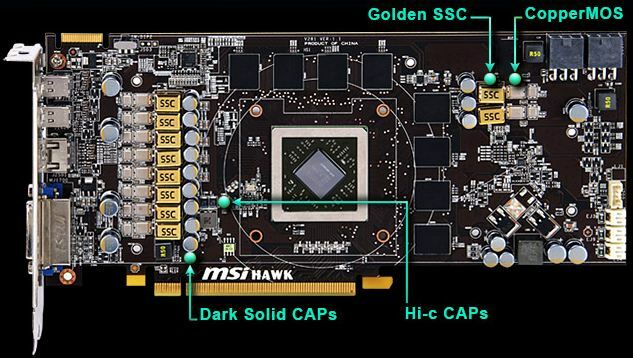 The card is fed by and requires usage of dual 6 pin PCI-E connectors, which means a max theoretical power draw of 225W. The R7870 HAWK looks to be a strong performer with looks that match that claim, but we will take a further look and take it for a spin as well to test this claim. The R7870 HAWK is found at a retail price of $319.99 on Newegg at the time of writing so it really drops it in a price point below the “big boys”. This is very beneficial to gamers who want the performance but can’t afford to drop $500 on a single piece of hardware. MSI has long touted the Military Class components on their cards due to the fact that they are specially tested components, not just by them but by a third party testing center according to the enclosed certificate. “Military Class components” sounds nice, but are they really necessary on a card or motherboard? Honestly, no, as most times the reference components are good enough to do their job. However, they are not designed to push the limits to the extreme. The answer is better and stronger components. Most manufacturers worth their salt will use better components, so in order to try and stand out, MSI uses “Military Class” components, in an attempt to ensure better hardware reliability. Here we see the layout and highlights of the Military Class components, starting with the gold caps, which add a nice, shiny appearance to the card as well. The CopperMOS is something we have seen before in high performance VRM’s. The absence of the composite capsule around it definitely helps it stay cooler and overall performance has been good from our experience previously. The solid state caps are a dark color for appearance’s sake, but their totally solid state nature means better overall reliability and working stability as well. MSI introduced the Twin Frozr cooler quite some time ago. The Twin Frozr is MSI’s version of the custom cooler to keep the GPU and components cool on the card. This is the Twin Frozr IV, which means that it has gone through some revisions over the years. As MSI learned new tricks and ways to optimize the performance, they added features such as the propeller bladed dual 80mm fans, large dual 80mm heatpipes on the outer edge to help accelerate heat dissipation. MSI has implemented a dust removal technology into the card which enforces a reversed rotation of the cooling fans for the first 30 seconds of operation to blow dust away from the cooler and help keep it clean to avoid blockages. This could definitely be helpful as we have seen in many cases of overheating and failure caused by dust that users did not know was there. 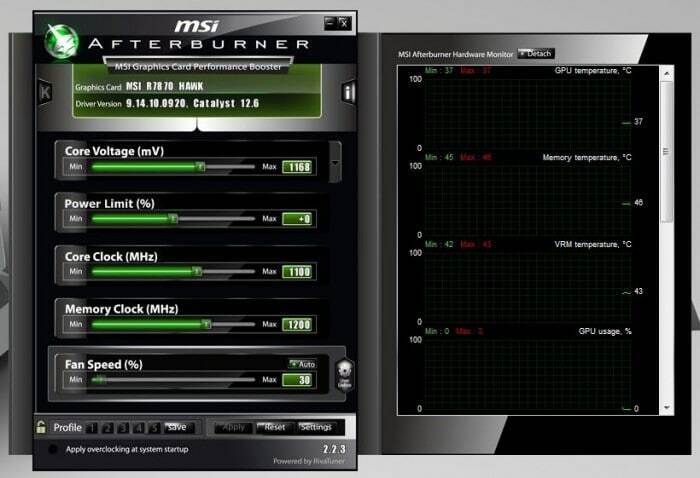 The MSI R7870 HAWK has a secondary “unlocked” BIOS which is meant for extreme overclocking. This BIOS removes all of the standard protections to allow for extreme overclocking that won’t get squashed by a standard BIOS protection. We would only recommend running this BIOS if running supplemental cooling, and even then only under proper precautions, as this can cause the card to overheat quickly if proper cooling is not applied, causing permanent damage. MSI offers its own software utility. MSI Afterburner is co-developed with Rivatuner which is very similar to what the other top manufacturers are offering. There we see it above with multiple options including voltage control and power limit controls to ensure our overclock ceiling is just a little bit higher. One really cool feature is the inclusion of the GPU Reactor module. One thing to note up front is this is more targeted at the extreme enthusiasts, and will net only marginal gains for regular users in an air cooled environment. 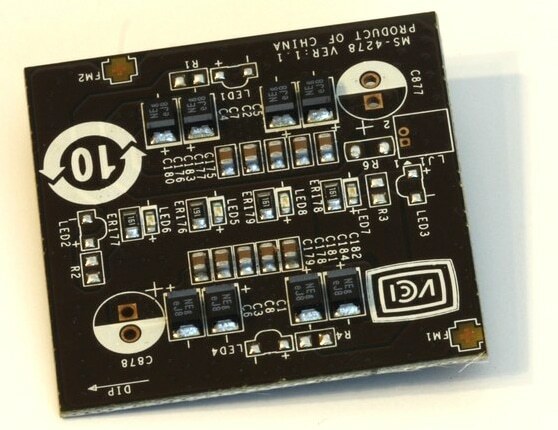 As seen above, the module is a separate PCB with multiple components to assist the stock VRM with power delivery directly to the rear of the GPU mounting. This is about the closest you can get to wiring it directly to the GPU itself. While this unit is nice, its real benefit will not be seen for the most part under standard cooling, as the kind of loads under which this supplemental device will assist will likely be under extreme benchmarking applications. Obviously, with such high loads and power delivery, the cooling needs to be proportional, keeping the card at sub-ambient temperatures. This level is where the GPU Reactor will shine. Under standard cooling it may help bolster the power circuit to the tune of a few extra MHz, but its true potential is under extreme load situations where users push clocks to the limit. Just for the cool factor, on the top of the PCB are blue LED’s which will light the MSI branded GPU Reactor cover to give an almost Iron-Man like appearance to the reactor unit. MSI knows that extreme users will want to monitor vitals so they implemented the V-Check point feature which allows users to plug in included cables. 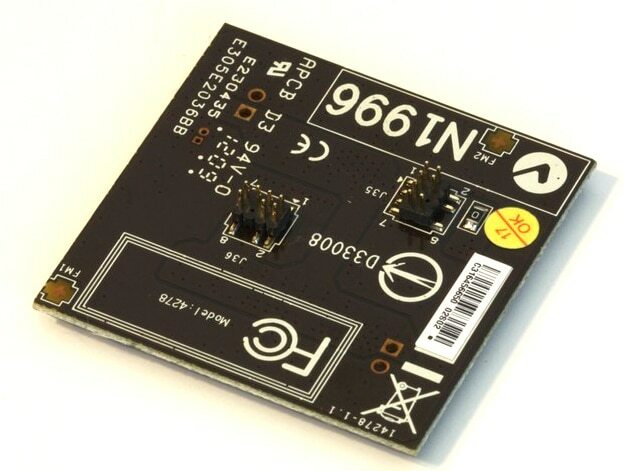 This allows users to insert a voltmeter probe and monitor voltages with extreme accuracy directly from the card’s PCB. Here we see the location along with what voltages can be monitored. Each lead carries both the signal and a ground connection, so that if needed, 3 voltmeters can be used during operation to keep an eye on the cards vitals. MSI delivers the 7 series products amped up and ready to run on PCI-E Gen 3 spec, and they even offer the boards to run it as well.